Top Shops Auto Body Supplies is your one-stop shop for paint, accessories, and the know-how you need to get your vehicle looking great to suit your individual taste. We sell to both auto body shops and people who work on their own cars. We also deliver to auto body shops. We can provide custom paint to match any vehicle colour. We also stock a variety of touch-up aerosol cans. Top Shops Auto Body Supplies is a small, mainly family-oriented business. Our staff will always be polite, and your service will always be personalized. Our customers can expect us to provide whatever they need, either from our own inventory, or if need be, ordered and received promptly. It's important to us that we help them complete their projects on schedule. One of the things we are best at is helping car owners learn to take care of their own vehicles. 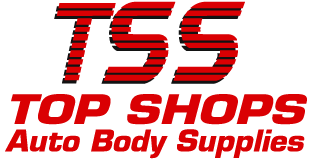 Top Shops Auto Body Supplies has the products, knowledge and information car owners can use to successfully complete their body and paint projects. Call us or stop by today for more information. at the prices you want. use our convenient online form.